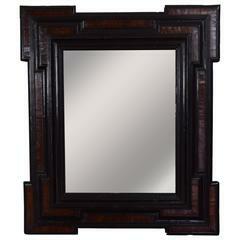 Sorry, Dutch Baroque Period Walnut and Ebonized Mirror Frame is not currently available. A beautiful Flemish Baroque style mirror having a faux tortoise panels and ebonized frame. A Dutch ebonized ripple picture frame now fitted with 19th Century mirror. The frame having notched corners and raised moldings, walnut veneers and ebonized moldings, now fitted with an "antiqued" mirror plate. Pair of Dutch, ebonized cushion frame mirrors. Each with a stepped and molded hand-carved frame and finish details. Glass in very good condition - aged appropriately. A mirror made during the Baroque period 18th century in Northern Europe. Ebonized frame. Made to be hanged on wall or standing on a table. Arched top and frame with molded corners.